Before purchasing our item, please read and understand our business policy and business approach below. We collect and sell valuable items which we confidently recommend at fair prices. One exception to it would be when customers take items without written statements of guarantee to publically qualified appraisal authorities and when they are clarified as forgeries by them (not based on customers’ own opinions or by third parties they choose). Thank you very much for your kind understanding. Japanese woodblock print in frame. Kogetsudai B 19/60 Kogetsudai is a cone shaped sand mound that can be found in the sand garden of Ginkaku-ji temple. The name translates to Moon Viewing Platform because it is said that if you were to look at the mound from the top floor of Ginkaku-ji then it would look like the full moon on a silent pond. The optimal time would to see it would have to be on a night when the full moon is out. Others have also said it to be a Zen representation of Mount Fuji. Either way it is amazing to see this perfectly shaped cone in the Zen sand garden. Hashimoto was born in Tottori Prefecture and graduated in 1924 as an art teacher from the Tokyo School of Fine Arts. He worked as a school-teacher from 1924 until 1955 and produced art in his spare time. After that he retired from teaching and began a full-time career as an artist. As a young man he pursued oil-painting but took up prints in 1936 as a result of attending Hiratsuka Un’ichi’s short course in woodblock printing in Tokyo. He remained a close friend of Hiratsuka’s from then on and participated in his various activities, such as the Yoyogi-ha group and the wartime print collection’Kitsutsuki hangashu’ (1943). 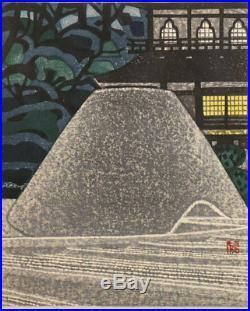 He first exhibited at the Japanese Print Association show in 1937. He contributed to the last Ichimoku-kai collection in 1950 and from that time began to be better known, especially after appearing in Statler’s’Modern Japanese Prints: An Art Reborn’ (1956). Much of his work before and after the Pacific War was devoted to Japanese castles and gardens, including the series’Kojo jukei’ (‘Ten Views of Old Castles’, 1946), but he also produced floral and figure subjects in his later career. Material = Paper(glass in frame) Condition= Normal. Size = 86 x 68 cm <33.5 x 26.5inch> Art Work = 63 x 51 cm <24.6 x 19.9inch> Weight = 5100 g (packing material is not included). Please do not hesitate to ask us for the best price and any other questions. It arrives in 5-7 days. Please let us know your TELEPHONE NUMBER that we write on the postal document and invoice. Please understand that the item has stains and wrinkles, but it is vintage. Since it is an old item, please look at the pictures closely and judge. The actual size, color or appearance may vary because of the lighting effects. Chosen carefully, we would guarantee these are handwriting (not printed) and the original. The item “En0744raKb Japanese woodblock print in frame Hashimoto Okiie Kogetsudai B 19/60″ is in sale since Saturday, May 12, 2018. This item is in the category “Antiques\Asian Antiques\Japan\Prints”. The seller is “en-corporation” and is located in HONSHU. This item can be shipped worldwide.